The first rule of data entry: No blank rows. The second: A field without a header is terra incognito. Rule two gets violated here, in the UK-government’s count of the nation’s (that is, England and Wales) property transactions for the first quarter this year (click the 2014 Price Paid Data sheet on the page when you get there). The Duration codes abbreviate Freeholder or Leaseholder, the former a permanent mode of ownership, the latter fixed-term (for additional enlightenment here, see this review). Column O – Record Status – comprises an endless skein of As, and as such should be deleted. In fact, I’d delete H, I, and J as a practical operational tack (street names won’t add much to the narrative), but I’m leaving them be simply for exposition’s sake. (I should add that it seems to me that Column N really names cities and towns, and not the purported County, but I’m holding (here, at least) to the web site’s field-naming sequence). Now we can proceed, at least after adding that the date data in C are over-formatted, interjecting as they do a constant 12:00:00 AM into every record, to no particular informational purpose. The Short Date format here should say bonne nuit to all those midnights. 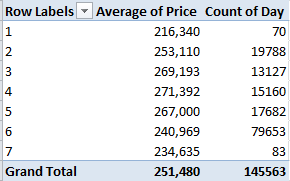 Peculiarities aside, the data are nothing if not informative. What about, for starters, a basic price-by-month breakout? That one’s a head-scratcher. Might the precipitous retraction in March activity owe more to a lag in the data gathering than any real buyer hesitancy? That’s a question for the data gatherers. And what about price and a property’s old/new standing? Thus something real is at work, I think. No, I can’t explain Fridays – day number 6. It’s possible some institution-wide protocol stays the processing of files until the work week’s end, but that’s one outsider’s supposition. Nor can I account for the Friday downswing in average price, which is notable and likely not driven by the probabilities. Looking for a story line, anyone? It’s the borough of Kensington and Chelsea – redoubt of oligarchs and other ruling-class sectaries – that leads the pricing parade, but that’s a dog-bites-man truism. 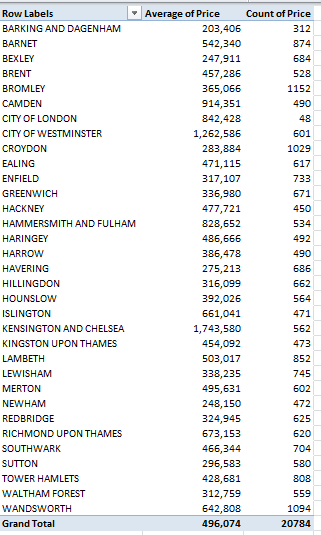 No more revelatory is London’s average £496,074 transaction figure, nearly double the overall average. What is interesting, however, is the city’s 20,784 sales during the quarter – 14.3% of the month’s total – when held up to London’s proportion of the England/Wales population – about 14.8%. In other words, the housing market in the capital appears to be no more frenetic, though considerably more pricey, than it is anywhere else – in spite of London’s vaunted economic hegemony. So what does it mean? This: sell your house in Chelsea, and buy one in Bexley.